ʻĀINA In Schools is off to a great start! Over 160 volunteer docents have been trained and began teaching garden-based learning, compost, and nutrition lessons to 6,863 students in 16 participating ʻĀINA schools. 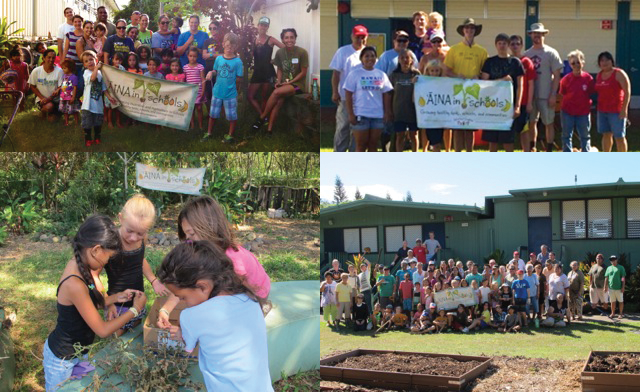 August was a month full of ʻĀINA Garden Parties where community members, families and teachers prepared their school gardens for garden lessons, built new garden beds, compost bins, and other improvements. Mahalo to the volunteer groups who came out to support ʻĀINA Schools with their garden parties: Hands in Helping Out, Hyatt Regency Waikiki Green Team, Mohala Farms, Marines of HMLA-367, Rotary E-Club of Hawaiʻi, and Lāʻie North Stake LDS Church.